I hope you enjoy browsing through this site and that you discover for yourself how unique Matthew Gibney Catholic Primary School really is. Since 1991, Matthew Gibney Catholic Primary School has provided and continues to provide a dynamic Catholic education for its students with the drive and capacity to provide quality earning opportunities for every student. The school works closely with St Francis of Assisi Parish to ensure that we can develop and strengthen the children in our care with experiences that will enrich their faith journeys. Our point of difference is our size. We are a single stream school (one class for each year level) which enables us to know every student both academically and socially. Our size helps us to give all our students the opportunities to participate in a variety of extra-curricular activities. We build supportive relationships with every member of our school community, as partners in our children’s learning. 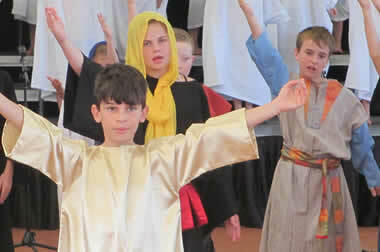 Matthew Gibney Catholic Primary School has a strong focus on Catholic values. We endeavour to get to know all our students and this helps us to meet their needs through differentiated teaching and learning experiences. The school has invested in technology. The students have access to a computer lab along with iPads in each of the classrooms. The students also have a designated IT lesson each week where they have the opportunity to develop skills in robotics and coding. The school is able to offer a dynamic creative arts and sporting programme. Students also learn to speak Italian. Matthew Gibney Catholic Primary School welcomes all new families to our school community. It is our hope that all the children will enjoy learning and be proud of their accomplishments. They will thrive in a safe and happy environment that allows for growth in the many areas of their development. This will all be achieved through the collaboration between our parents, teachers and children working towards a common goal.